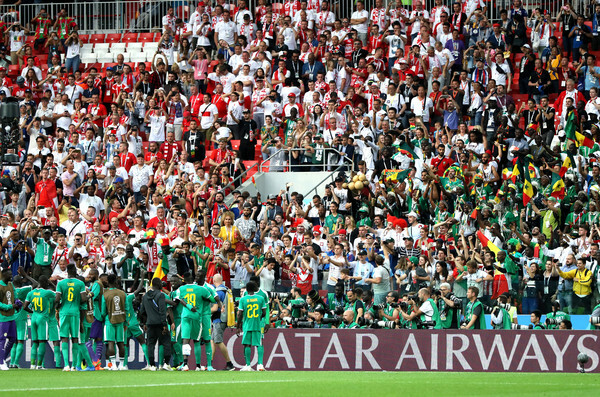 Senegal players acknowledge the fans following the 2018 FIFA World Cup Russia group H match between Poland and Senegal at Spartak Stadium on June 19, 2018 in Moscow, Russia. Japan won their opener, albeit against a ten man Colombia, they did what had to be done and are well placed to advance to the next stage, first they have business to do with Senegal, conquerors of Poland. This would be a fiery affair, the experience of Shinji Kagawa, Keisuke Honda and Maya Yoshida of Southampton up against the pace and power of Sadio Mane, Mbaye Niang, and Kalidou Koulibally. Two different orientations near parity in abilities, this would be a cracker of sort. Who needs it more? That’s hard to answer, Japan are up against Poland next and considering the fact that the Europeans lost their opener to Senegal, they would need points in their final group game to stand a chance of qualifying. Senegal plays Colombia next, they would prefer to do their business here and enjoy the final group game, this makes this a do or die. Man for man it looks even, tactics for tactics it looks balanced, but showings in their respective openers tilt this slightly in favour of the Africans; Japan had it easy against Colombia who had Carlos Sanchez sent off early while Senegal labored with full concentration to hold off Poland who fought back late on. Senegal are the hopes of Africa, with the three north Africans in the competition dumped out already, with one eye on what Nigeria does against Argentina, dear Senegal… Africa is watching.